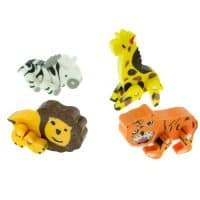 Jungle safari party boxes are made of cardboard and are around 14cm x 9.5cm x 12cm. Each box will arrive flat packed to save on expensive postage and constructed by simply pushing the flaps to open. Fill your themed lunch boxes with sandwiches, nuggets and chips or your other party food. Why not try them as an alternative to the party bag and fill them with party favors or party sweets. We have 3 styles of jungle lunch boxes and where possible you will receive a selection of from the styles available.